If there is anything else that we can help you with, please don't hesitate to call. hank you for choosing Digital Film Studios, suppliers of Studios, Grip, Lighting, Production Supplies & Digital Cameras to the growing independent film community. We work with a lot of different types of customers, and we’ve developed a “workflow” to enable us to help all those different types in as efficient and modern way as possible. We’ve outlined this below, and would appreciate you reading through it so that you have a good understanding of how we expect to work with you. We’ve embraced today’s brave new world, and leverage the web to exchange information with our customers. We do this using a web site, rightsignature.com, a secure site that banks, realtors and other organizations use to securely present and sign contracts and information with their customers. It’s an easy way to securely read, fill out, and sign practically any document without scanning, faxing, or printing it. You can use your mouse, your webcam, or even your mobile phone’s touchscreen to sign your name when the time comes. People who work with us frequently love it. In order to prepare an estimate or quote, we need to know who we are renting to. We’ve developed a form that we ask you to fill out and sign. The crew information on there may look daunting, but it’s not really: we ask that you tell us who you’re working with so that we can answer your questions. Plus, you only need to tell us the name of the person who will be receiving all quotes, rental orders, and invoices. At times, these will be different people, and other times it will be the same person receiving all paperwork – this is a choice that you’ll make on the form (one choice per category) when you fill it out. Go here to fill it out. It will come back to us auto-magically. Digital Film Studios must receive advance notice of any rentals that will be used outside of the US. If you do not currently have a production insurance policy, we may be able to assist you in contacting the appropriate parties to obtain such insurance. 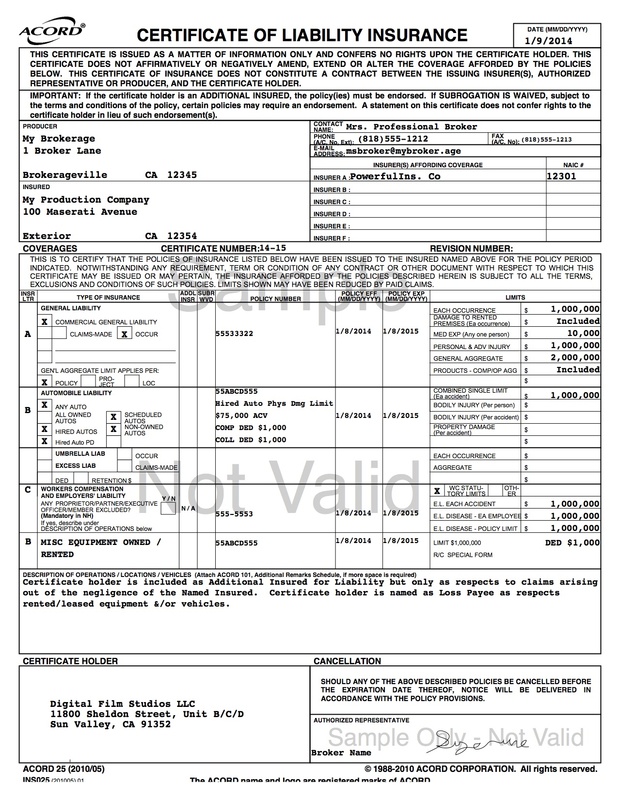 Below is a sample certificate of insurance. Click the button above to be taken to our Athos Insurance partner website, and purchase equipment-only coverage or a full policy. You’ll want to send us a list of equipment that you would like to rent; we’ll send you back a quote and once the bottom line is to your liking and you agree to the package, we’ll send you a link via email that will take you back to rightsignature.com where you’ll sign our contract/terms & conditions. If you’re curious or would like to read it now, it can be found here: Rental Agreement. If you are renting a stage, you will also need to sign the Stage Rental Agreement as well. 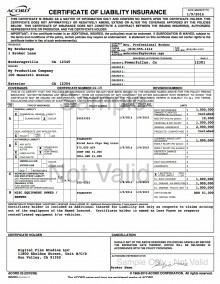 All invoices are COD, meaning we require payment prior to equipment pickup or the start of production at our facility. We will charge your credit card unless you make payment by other means. We accept cash, company checks, Money Orders or Credit Card payments (Visa, MasterCard, Discover or American Express). An additional 3.5% charge will be added to ALL CREDIT CARD payments. Checkout: Subject to when your order is placed and finalized, in general, equipment will be available for inspection at our facility after noon the day prior to the start of your rental and will be available for pickup after 3pm. We prefer to schedule camera preps for specific hours in order to maximize the available prep time and space for all of our customers, so we may ask your representative to come at a specific time on the day before the rental in order to prep. Returns: Any camera or other equipment returned after 10:30 AM on the expected day of return will be charged the standard rental rate for that day. Any trucks returned after 8:00 AM on the expected day of return will be charged an additional day at the standard rental rate. Any lost or damaged equipment will be charged for accordingly. In general, we will ask you to place a deposit for the amount of your insurance deductible or for the value of the equipment (whichever is lower) before releasing the equipment for rent. Most customers choose to leave this deposit using a credit card, although we do accept cash and money orders for this purpose as well. If using a credit card, we’ll place an authorization on your card for the amount. This authorization will be used to satisfy any residual charges to your account, and any remaining amounts will be released by your credit card company at their convenience once the authorization expires. To do this, you must fill out and sign the DFS Credit Card Authorization Form. Clicking the link will take you rightsignature.com where you can securely review and sign the form. If you are unable to provide us with a Credit Card please call to make other arrangements. Our sincere thanks, and see you soon! If there is anything else that we can help you with, please don’t hesitate to call.